I have a quick swatch to share with you today! I don't think I use all the glitter toppers I own nearly enough. so I decided to feature one of the lovelies that often catches my eye when I open the drawer. 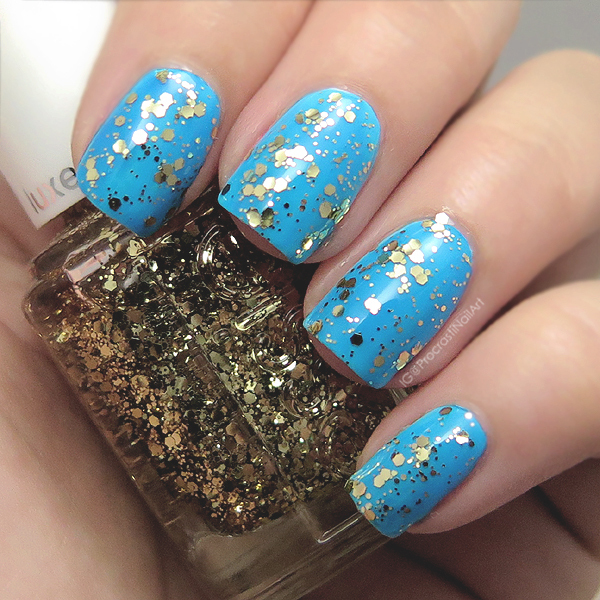 This is Essie Rock at the Top, originally from the Winter 2014 Luxeffects Collection! 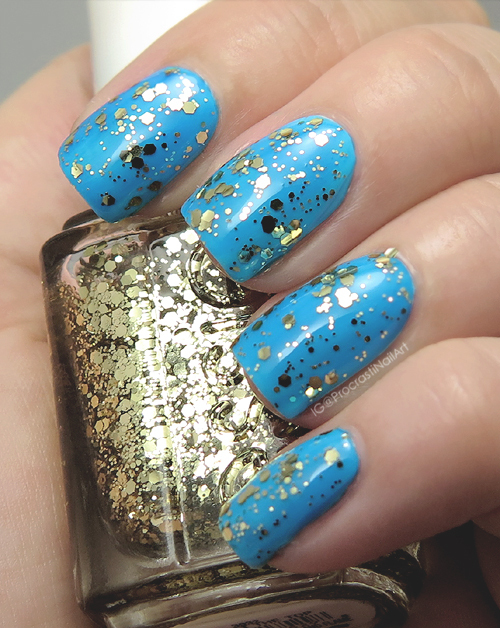 I swatched this gorgeous multi-sized gold hex glitter topper over Essie In It to Wyn It (swatched originally here). I love the contrast of the gold over the vibrant blue! And believe it or not this is one coat of Essie Rock at the Top - no need for sponging or multiple coats to get this much coverage! Perfection! I love a good gold glitter and this one seems very nice. Wonderful swatch over that blue base polish too. I love how simple this is! Great shade of blue! I agree with the New Year's manicure, this would be perfect! Glitter is a great way to extend a manicure. I say throw it on top of everything the day before you remove it! I too am guilty of not using my glitter toppers enough.I really like the simple drama Essie Rock at the Top gives, and its super impressive that its only one coat from the brush! Oh this combo is wonderfully fresh yet classy, I love it! Ohhh, I love this color combination! Gold and blue always work so well together! I've thought about buying this topper a million times. I may just have to do it!